The San Diego Tourism Authority welcomes you to San Diego! We are all delighted to have the opportunity of hosting the Childhood Obesity 2015 Conference, and trust your conference will be nothing less than perfect. Best known for our near-perfect climate, natural beauty and many fun-filled outdoor recreational activities, San Diego is blessed with a wealth of riches not bestowed on many places, including a relaxed and friendly spirit that characterizes the best of the Southern California lifestyle. Our pulse is decidedly creative, entrepreneurial and energetic. Our key ingredient is our splendid team of hospitality professionals, especially those you will meet at the Town & Country Resort & Convention Center. We’re confident that our sun-soaked setting and easy-going vibe will inspire more creativity and innovation, making your conference the best ever. It has come to our attention that housing companies named "Exhibition Housing Management," or also referred to as, "Exhibition Housing Services,” and "Global Travel Services" are claiming to have a relationship with the Childhood Obesity Conference and are offering hotel reservation services for the 8th Biennial Childhood Obesity Conference. These companies and others like them are NOT in any way affiliated with the Childhood Obesity Conference and should NOT be used to make hotel reservations. All hotel reservations should be booked directly with the Town and Country Resort & Conference Center (see below). Click here for more information on this scam. Click here to book your reservation online or call (619) 692-3800 and mention "Childhood Obesity Conference". Rates are guaranteed through June 5, 2015. These rates are available until the room block sells out, or until the reservation cut-off date (whichever comes first). Click here to book your reservation online or call (619) 291-5720 and mention "Childhood Obesity Conference". Please note: Shuttle service between the Town & Country Hotel and all overflow hotels will be provided. Click here for the shuttle schedule. Located in the Heart of San Diego, America’s Finest City, the Town and Country Resort Hotel encompasses the “Best of All Worlds.” Our hotel, in Mission Valley San Diego, is just minutes from the vibrant nightlife of Downtown San Diego, the oasis of beautiful Mission Valley, and the thrill of San Diego’s beaches and attractions. Our Mission Valley San Diego hotel is a family-owned resort with a heritage of hospitality spanning more than five decades, the Town and Country Resort Hotel enjoys an award-winning reputation for putting smiles on the faces of vacation guests and conference attendees alike. Whether you spend your time basking in the warm San Diego sun or in the warmth of our friendly service and hospitality, your stay at Town and Country Resort Hotel will reward you with a rich glow of satisfaction. Please note: Our block at The Town and Country hotel is sold out. The conference has obtained a special group rate of $125 single and $135 double occupancy plus tax and $7 per night resort fee (based on availability). To book your accommodations, call the Town and Country directly at 800-772-8527 and mention your participation in the 2015 Childhood Obesity Conference or click here to book your reservation online. Rates are guaranteed through June 7, 2015. These rates will be available until the room block sells out, or until the reservation cut-off date (whichever comes first). Please note: A one night’s room deposit is required when booking your stay. Self-parking at the Town and Country has been reduced to $6 daily for all overnight guests. Daily parking is $18 with in and out privileges. The San Diego International Airport is located approximately 6 miles from the Town and Country Resort and Conference Center. All major airlines fly in and out of the San Diego International Airport. Shuttle service arrangements to and from the airport and your hotel can be made through Cloud 9 Super Shuttle or by calling (800) 258-3826. The cost is approximately $11 per person (one-way). Reservations from the airport to the hotel are not required. Returning from the hotel to the airport requires a reservation to be made 24-hour in advance. Taxi service is available on a first come, first serve basis from the lower level curb of all terminals. Approximate cost from San Diego International Airport to the Town and Country is $25 and up per cab (one-way). Just a short stroll from the Town and Country Resort Hotel will take you to the San Diego Trolley pick-up. 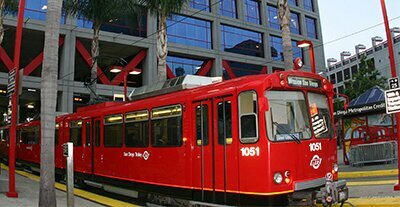 The trolley is a great way to get around San Diego when you’re sightseeing, shopping, or going to specific events. 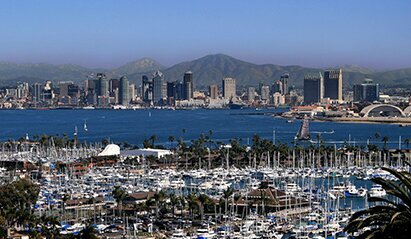 Travel by trolley to the Gaslamp Quarter, Old Town, Downtown San Diego, the Convention Center and Seaport Village. You can also reach San Diego’s sporting event venues - Qualcomm Stadium, Petco Park, San Diego State and Viejas Arena by trolley. For schedules and additional information on the trolley, bus and coaster schedules, click here. The San Diego Padres will take on the Seattle Mariners - Tuesday, June 30th at 7:10pm at Petco Park. Enjoy the game with discounted tickets as a 2015 Childhood Obesity Conference Attendee! To purchase your discounted tickets, please visit www.padres.com/events and scroll down to find your link listed as Childhood Obesity Conference. You will receive an email with a link to print your tickets!